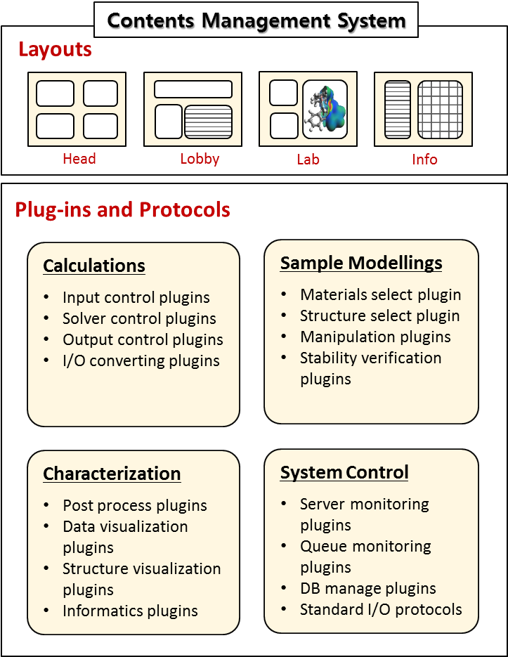 'SimPL' is a Content Management System for Simulation Platforms. - You can create your own simulation platform customized for you with functions what you want . - You can do modeling, calculation, and analysis in one platform. - Your platform development process will be very simple. - You can easily import platforms shared by others and create new platforms or add functions to your platform. "Page" is a web page which consists of standard web elements(images, texts, links, input form...) and SimPL web components. "Plugin" is a small program which connects back-end elements(such as solver, linux server,...) to Pages. Currently, Plugins are written in Python(2.7.3) and we're planing to give more options to SimPL Creators. Job is the place to store something in SimPL. It is structured to store any data. You can store and load data by the plugin built-in functions saveJobs and getJobs. - You can upload files for "web" and "server". - Files to be used by the plugin are uploaded to "Repository for Server". They can be read with the plugin built-in function getRepo.